Pedalboards, although a necessity for many guitar players, are typically not on the cutting edge of guitar gear. Many designs have been around for years, with the only updates being expanded or contracted dimensions. Enter Christian Trifilio, the mastermind behind Chemistry Design Werks, the company that gives us the Holeyboard. Based out of St. Paul, MN, Trifilio applies his knowledge and skills in industrial design to create incredible, innovative pedalboard solutions for the modern player. His vision to create a pedal-friendly pedalboard that doesn’t require Velcro or other messy adhesives came to life with the Holeyboard, and like all great innovators do, he has continued to expand and modify his designs based on customer feedback. I had the pleasure of talking with Mr. Trifilio about pedals, pedalboards, the source of his inspiration, and music in general - let’s take a look into the mind of the man that gave pedalboards their groove back. 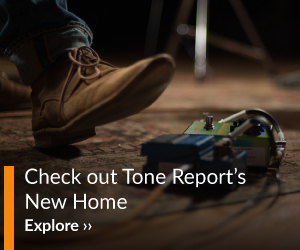 Tone Report: Tell us about your musical background. Christian Trifilio: I have two wonderful parents, but due to them simply not knowing better, I grew up listening to Muzak over the radio. I’m the youngest of four, my two sisters and my brother all took piano and lessons and they hated it. It made my parents’ lives miserable so I wasn’t signed up for anything. I actually begged to play piano, and finally I was able to start trumpet later. I took private lessons for a year then joined concert band and jazz band at school, it was awesome. My musical awakening came on a snowy day in northern Michigan, there was a blizzard coming in and I was driving in my ’83 Honda Civic to go to my first job, making pizzas at a local ski mountain. I remember the cold and seeing my breath, the silence of the car on the snow-covered road, and I turned on the radio and heard “Let It Be” for the first time. It blew my mind and I never looked back. I actually had a guitar when I was 18 but only learned three or four chords. It wasn’t until I was 28 that I decided to be like a Jedi and build my own guitar and learn how to play it better. I made a Tele-style guitar that I still have. I’ve rewired it 40 times, put on new necks, and replaced everything, but it still has magic. I took lessons from a guy who was a working musician and he had a way of teaching that opened up the neck for me and I immediately started writing songs and started a band. I read a great interview with the Black Crowes 20 or so years ago and they said when they started, they weren’t good enough to play covers so they wrote their own songs. I liked that idea a lot and took the same path, although I skipped the part about being in a famous rock band. 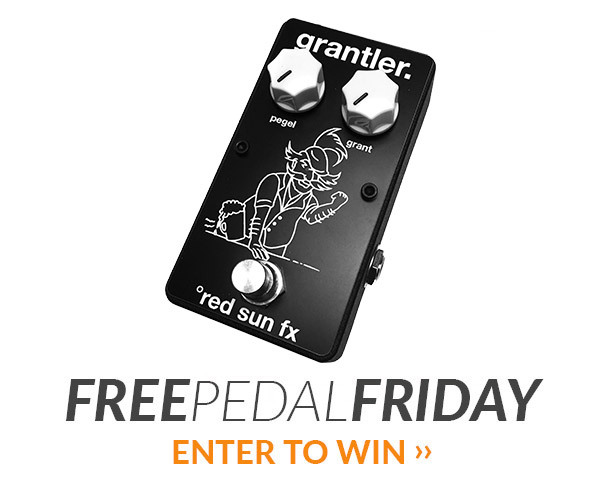 TR: When did you decide to enter the competitive arena of pedalboards, and why? CT: Well, I never started because I wanted to compete, and I think that is important. I really started just wanting to create something that worked better for myself. I come from a long line of craftsman, tinkerers, builders of stuff; my favorite character growing up was Q from James Bond—I wanted to be an inventor. My actual career path took me through a degree in Industrial Design and Ethnographic Research and 20 years of designing products for other people from blow torches to orthopedic instruments for knee surgery. I learned and practiced how to creatively solve problems and I think maybe that’s the answer to the question. My greatest strength is problem solving and it’s what I enjoy the most. I was in a band and tried Velcro, was appalled, and started building prototypes and constantly evolving the design, which I still do to this day. I was then sitting on a plane three days before Christmas and the toilet was overflowing. We were on the tarmac for three hours and I just wanted to see my kids. It was at that point that I said “This is not a way to spend the rest of my life, I need a big change.” I got back home and started planning the road that led to where I am now. TR: What, if anything, inspired your designs? CT: Charles and Ray Eames, their work with molded plywood and new materials in the ‘40s, inspired me to be a designer. Also, the truth to materials and truth to construction from the Arts and Crafts period early in the 20th century, showing what something is and how it’s constructed can be beautiful. The semantics of the Bauhaus movement—how can an object tell you how to use it through form, color, texture and materials? And skateboard decks and the punk movement of the early ‘80s. I love the DIY aesthetic and attitude; everyone should be able to express themselves. Patagonia, as a company, and Yvon Chouinard has been a lifelong inspiration. They have made bold steps in being leaders to make the things we use and live with more sustainable as well as make them more functional and beautiful. That’s a big deal to me, although I am disappointed that they no longer make anything in the US. Which would leave me to say that I’m inspired by the other little companies out there like mine who are doing it here at home and giving it their best. You all are awesome and I know how hard it is—you rock. TR: I'm surprised there aren't more alternatives to Velcro-based boards. Did you have any concepts prior to the Holeyboard design? early prototypes, they are fun to see. come up with five completely different solutions. Also, it depends on your approach. I think the fact that I approach the design of Holeyboards from starting with the right problems to solve drives the fact that they are so different. An alternative way to approach designing a pedalboard would be to start with what else is already out there and try to improve or modify that. I think that is the approach most companies take with many products, and it leads to iteration rather than innovation, and a lack of differentiation. It’s a lot harder to start from scratch but a lot more fun. I didn’t think music would be practical and I thought that art would be the real one.The jenniferpalmerstudio.com show the real image of music and people like to see this type of images.